Janet Prescott visited Paris to take-in Première Vision, the world’s leading fabrics fair. The halls in Paris for Spring/Summer 2020 were light and airy and the staging chimed well with colourful fabrics shown for Spring/Summer 2020. One of the main trends in the sportswear section were the bright pink, orange, blue and red fabrics with specific technical features which dominated the largest Hall. In the Wearable Lab innovations were grouped together. Graphene fabrics are made from a single layer of graphite, bonded carbon atoms arranged in a hexagonal pattern. They conduct heat easily, yet its qualities have yet to be fully exploited for textiles. Potential applications include incorporating lightweight, thin and flexible electric/photonics (the transmission of photons e.g. in fibre optics), say Kyorene, the graphene oxide fibre. The yarns are bacteriostatic, deodorant and UV protective, anti-dust mite, and withstand several wash cycles. Merino wool T-shirts developed by Kyorene and The Woolmark Company was displayed showing the market it is reaching now. Kyorene was developed by the large international private company, the QS, known for protective equipment and renewable solar cells. Graphene is the strongest material found and has more potential to develop further. Follow the link to read more – Focus on responsible production at Première Vision Paris. The event now brings its world-class seminar series and hand-selected exhibitors to the European market for the launch of Apparel Textile Sourcing Germany (ATSG) at the Estrel Convention Center in Berlin, from 11-13 September. Read the full story here – Apparel Textile Sourcing expands to European market. Meanwhile in Bangladesh, Coats, the world’s leading thread manufacturer has been busy hosting its own event. Coats Global Services (CGS), a Coats business providing complementary software solutions to the apparel and footwear supply chain, concluded the first series of Apparel Tech Up in Bangladesh in Dhaka and Chittagong last month. The event received a positive response and was attended by over 100 top level stakeholders of the Bangladesh RMG industry. These included Mr Mehroz (DMD, MBM Group), Ms Vidya Amrit Khan (DMD, Desh Garments), Mr Moazzam (CEO, Viyellatex), and more. The seminar centred around the concept of data being the key for business success. Read more here – CGS concludes Apparel Tech Up series in Bangladesh. Benetton is one of the best-known fashion companies in the world, with knitwear and wool playing a central part in its overall strategy and identity. The Italian company has confirmed its role as a key player in the worldwide wool industry by opening its doors to the IWTO’s 88th annual congress for one day in April 2019. Read all about it here – Benetton welcomes IWTO. The fourth edition of the textiles fair BSTIM (Best Solutions in Textile Manufacturing) closed after two days of intense activity. 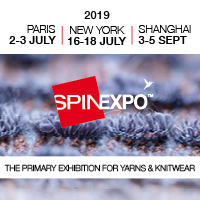 The event has reached its marked targets, according to the organisers, bringing 60 exhibiting companies together, with more than a thousand buyers representing international brands, big distributors and designers interested in finding suppliers “in proximity”. “Some of these buyers come from England, France, Belgium, Mexico, Morocco, Italy and Germany, which consolidates BSTIM as an international event,” organisers said. Read the final report here – Digitalisation and sustainability at BSTIM. Scheduled from 5-8 December 2019 in Gandhinagar at the outskirts of the Ahmedabad, the third ITMACH India 2019 exhibition is already getting ready to welcome more exhibitors than ever before, featuring the latest technologies in spinning, knitting, weaving, dyeing, printing and textile processing, knowledge sharing sessions and larger exhibition area, attracting global visitors. The third edition of ITMACH India will be held in Gandhinagar, Gujarat, the most important textiles manufacturing hub in the country. “This edition of ITMACH India will be important for the textiles industry, especially in the Asian region, being the first large scale show in India, just about six months after ITMA 2019, in Barcelona,” organisers report. Read about it here – Plans afoot for bigger ITMACH India 2019. Pop over to our sister site Innovation in Textiles to read a great ISPO report from our correspondent Anne Prahl – Sustainable material and process innovation at ISPO Munich and check out her interview with Nello Morelli at ISPO - Classic performance meets innovative surface design at Eurojersey.